Have you seen a BubbleBum? We discovered BubbleBum inflatable booster seats a few weeks ago—and I must say that I wish I had known about them sooner. Oh, so many vacations would have been so much easier over the years with this unique booster seat! 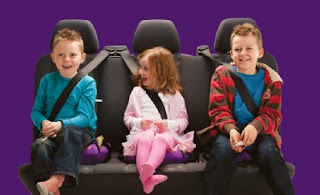 What do we like about BubbleBum booster seats? BubbleBum booster seats work great for carpools. In Ohio, like many other states, we have booster seat laws with specific age, height and weight requirements. While my middle daughter is 8 years old—she weighs only slightly over 50 pounds—as do many of her friends. Since we frequently carpool, booster seat storage and transfers become inconvenient. Having an inflatable option allows us to easily store away two or three booster seats in the car and only pull one out when we need one. BubbleBum seats are also sized to fit three across in many larger vehicles! BubbleBum offers a super-simple, lightweight, option for family travelers. 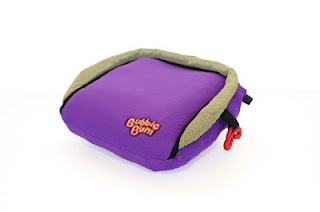 The inflatable booster seat literally weighs around a pound, deflates fully and can be stored away in a bag during travel. The BubbleBum is safe and durable. At first I was concerned about the safety and durability of the booster seat—but, BubbleBum was named by the IIHS (Insurance Institute of Highway Safety) as a “Best Bet” in their booster seat evaluation report, and they listed BubbleBum as one of the best booster seats for safety. BubbleBum also recently received the PTPA (Parent Tested Parent Approved) Media Awards and JPMA Awards which consider a number of parent and family friendly criteria in their award selections. BubbleBum is also a finalist in the 2012 Cribsie Awards—and would love your vote! Think BubbleBum would make your travel adventures easier? We do! How can you win a free BubbleBum Booster Seat? Hurry!!! Contest Ends 3/16/2012!!!!! 3/18/12 We have chosen a winner! KC has confirmed her details and the BubbleBum should be on the way shortly! Thank you everyone for entering!!! This would be great for us to use for our grandson instead of having to move car seats out of other vehicles. It looks very easy to get in and out of the car, a huge plus when switching kids around to relatives cars. My grandson would be able to enjoy the ride because he be able to see out the window a little better especialy sience hes no longer in a car seat! Thank you! This would be great for when my younger nieces & nephews travel with us. It takes up so little space in storage so I could easily stash it in the trunk of my small car for when I need it. For the grandparents to take the kids with them somewhere. can stop dragging around that HEAVY, HUGE Booster. So hard to travel with! It would give me flexibility to not have to carry around a booster especially with 2 kids under the age of 3! This would be easier than having to carry a booster seat on the plane. It would make traveling much easier. We love to travel as a family. Car seats and boosters are a challenge as we always rent a car. We would love to win this! it would be easier because we wouldnt have to ask for those chunky awkward booster seats in restaurants when stopping during a long drive. It would be great to be able to take my nephew in the car to the local kid spots. I haven't been able to do this due to the necessity of a booster. This would be amazing on vacation especially with 4 kids. We're constantly having to move Ian's carseat between cars since I have him so often while his mom works. Ki forgets to leave it with me sometimes so we can't get out on those days. This looks so wonderful. We have grandkids, and they only come every couple years. We do need them, but they take a lot of storage space, so this would be great! We take a lot of road trips when they come visit. Light weight means it would be easier to swap between cars! she can go where ever with Nana and Mom won't have to keep disconnecting and reconnecting the car seat. Plus I think this would be perfect for us to use if we go out to dinner lunch etc. No one wants to use those grimmy booster seats that who knows the last time they were cleaned!